The market for energy efficient devices is on the rise as we move towards a more autonomous world. Today’s wireless technologies like cellular and wireless local area networks (WLAN) are not optimized for such use, which has led to development of the new Low Power Wide Area (LPWA) networks. LPWA technologies aim to solve legacy wireless technologies’ problems, such as low battery lifetime, limited signal range and scalability, by lowering data rates and optimizing the use of the bandwidth. NarrowBand-IoT (NB-IoT) and LTE Cat M1 (LTE-M) are two upcoming LPWA technologies that emerged in Release 13 by the 3rd Generation Partnership Project (3GPP). They implement two new power saving features: Power Saving Mode (PSM) and extended Discontinuous Reception (eDRX) that (along with NB-IoT and LTE-M) are the focus of this research. If your application listens for incoming messages from the network often, eDRX would be more suitable. If the application is meant to only send data, PSM might be a better choice. In addition to the type of use case, it is important to know the device’s expected lifetime and if it has access to a power source. Using eDRX requires more power than PSM but can be used in more complicated applications. There are three types of cycles in PSM: active, idle and sleep. During the active cycle, device can send its data to a desired destination. Immediately after the active cycle comes one idle cycle, during which the modem listens for incoming messages. After this, modem enters deep-sleep. 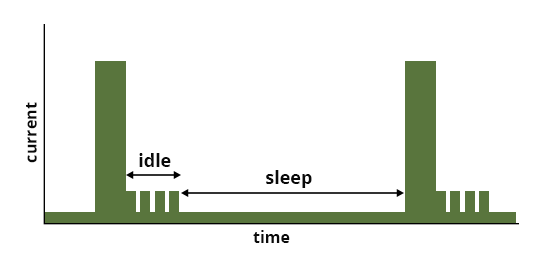 In most cases, the length of idle and sleep cycle is chosen by the network but can in some cases, if the network allows it, be chosen by the device. eDRX has the same three cycles as PSM but is more focused on listening the downlink for incoming messages. Instead of having to enter an active cycle each time, it periodically listens for messages during an idle cycle. The period between each idle cycle can be modified, but just like with PSM, it is mostly done by the network. Purpose of the experiment was to measure the difference in energy consumption during different modes. Measurements for both PSM and eDRX were done on two different operators’ network. The networks used were test networks, i.e. they are still under development and not yet available for commercial use. The results of the experiment show that using NB-IoT with PSM it is possible to achieve a lifetime up to 4753 days with a 5 Wh battery. Using PSM with LTE-M, the maximum lifetime was 3496 days. These results can be achieved by waking up the module once a month. If the device has to wake up more often, say once a day, the lifetime for NB-IoT drops to 105 days and for LTE-M it drops to 17 days. Using eDRX with NB-IoT lifetime is further shortened: using the same 5 Wh battery it was measured to be around 79h. The energy consumption was calculated for one active cycle and 2000 cycles of both sleep and idle. This feature was only tested on NB-IoT, since at the time of the experiment it was not available for LTE-M. It is important to note that no data was sent during these experiments, instead only the bear minimum communication between device and network was measured. This can be used as a baseline for further research.